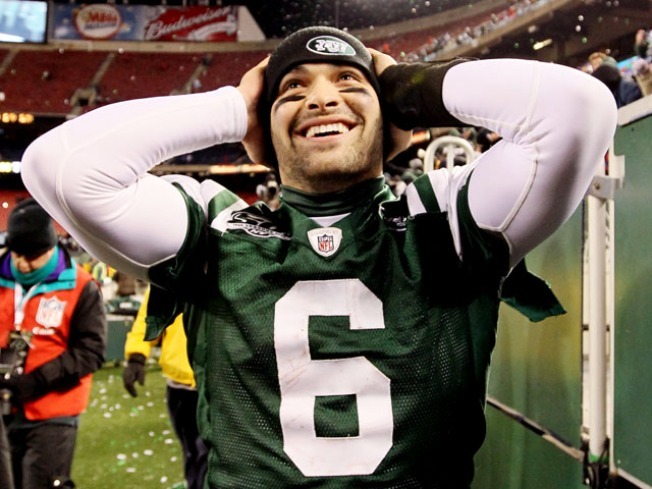 Quarterback Mark Sanchez smiles while celebrating the Jets' 37-0 victory over the Cincinnati Bengals at Giants Stadium on January 3, 2010. Normally a trip to Cincinnati doesn't qualify as a prize, but there hasn't been much normal about this Jets season. They survived a rookie quarterback throwing 20 interceptions, a pair of 3-game losing streaks marked by stunning amounts of self-mutilation and a coach who proclaimed their season over with two games to play to make the playoffs -- all by dominating the Bengals 37-0 in what was almost certainly the final game ever played at Giants Stadium. There wasn't much in doubt about the game after the first half and, unlike last week, it wasn't because the Bengals didn't show up to play ball. They had a chance to move up to the third seed in the AFC with a victory, but it was clear from the outset that they didn't want the game as much as the Jets. The Jets led 27-0 because their offensive line pushed the Bengals around from the opening whistle. The Jets held onto the ball for nearly 25 of the first 30 minutes, including 13:54 of the first quarter, and outgained the Bengals 250-7 for the half. The Bengals defenders looked like they were wearing roller skates on most plays and it wasn't long before the visitors looked content to get out of the bitter cold and prepare for next week's rematch. Other than the line, the offensive hero for the Jets was Brad Smith. Smith, a wide receiver, played quarterback at Missouri and took several snaps in the first half that turned into either option plays or straight runs. He gained 92 yards, scored a touchdown and kept the already befuddled Bengals on their heels every time he touched the ball. Whether the gimmickry remains a part of the Jets offense next week remains to be seen, but it's probably something worth considering. As you could probably guess from the final score, the defense continued to play at a high level on Sunday night. The Jets allowed only 47 points in their last six games, a miniscule total that makes good on all of the wildest offseason dreams about what Rex Ryan would bring to the team. Wild as those dreams might have been, though, they were nothing compared to playoff talk when the Jets were 4-6 or even when they blew a chance to beat the Falcons in Week 15. Thanks to a streak of luck and timely play that goes against their entire history, however, the Jets live to play at least one more game against a team they handled with little trouble on Sunday night. Suddenly Cincinnati in January doesn't sound so bad, does it?